2014, you have been good to me! It has been a great year filled with new beginnings, adventures and of course new life. Looking back on the year only makes me look forward to what else is in store for me next year. If you follow me on social media, this week we looked back on the most popular blog posts of 2014. Here are my top three most viewed blogs of 2014. #3: Almond Huller & Sheller. I took you guys on a tour of our almond huller and sheller for a chance to peak into how almonds are prepped for processing. It was a first hand look at taking the hulls and shells off the almond and exposing the meat to be processed for consumption. Our Christmas Gift Came Early! Our little almond farmer arrived on December 6th! Little Henry was born at 11:48pm after only about 5 hours of labor. I am so happy and blessed that it was a very short labor because I don't think I could have handled any longer. I do not do pain very well! He was 7lbs 5oz and 20 1/2 inches long. When my almond farmer husband was born he was 10 pounds, so needless to say I was very excited my little boy was 7 lbs! We are so happy to have our little boy here to celebrate the Christmas season with! We couldn't have asked for a better Christmas gift! From our family to yours, we wish you all a Merry Christmas and blessed New Year. May all your celebrations this season be filled with love and happiness! After almond harvest and when the trees have gone dormant, we put our doctor hats on to see if we have any sick trees that need mending. Winter is a great time to repair any trees and general maintenance around the farm. When almonds are too green, the almonds aren't dried enough to shake off the tree with ease. The almonds will hold on to the tree branches because there hasn't been enough moisture released. Some trees may be younger than the majority of the orchard causing them to mature differently and not be as ready for harvest when the rest of the field is. When either one of these happens the shaker operator may have to shake the tree longer than expected to get all the almonds off. This may cause the bark to loosen and fall off exposing the trunk of the tree. If the trunk of the tree has too much moisture the bark will loosen making it easier to fall off as well. Are you all recovered from your turkey comas? If you are like our family, you are still recovering from all the food you ate on Thanksgiving. If you also like me, you may have a heap of leftovers and looking to reinvent them to make something new. Well I bought a 30 oz can of pumpkin not knowing that my recipe only called for 15 oz of pumpkin. So, if you still have some pumpkin in your fridge or maybe you didn't get your pumpkin fix and you want more! Here is a simple and easy pumpkin bar recipe and what else but almond crust. Note: I didn't add the dates the first time I made this, and it really does need that extra sweetness of the dates. Let me start off by saying that I love antiques and any furniture with a story. Most of my house is furniture that my almond farmer or I have inherited from family members that have gone before us, or we have bought at estate sales or antique shops, or just thought they looked old. When I was thinking of baby furniture for our little almond farmer, I wanted to keep with the same trend and look for something that had the antique look. Being that my father keeps everything, I wasnt surprised to find out that my parents still had the crib and changing table that I used. I knew I wanted it, so I asked my Dad to pull it down from the old shop shelves and see what condition it was in. One year ago today, I started this blog. Wow, I can't believe it's been a year already since I started this journey! Time sure has flown by and I have enjoyed every minute of it. I have learned a lot over the last year about blogging, who follows me, what to write about, and even our very own farm. I continue to learn as well from you guys out there and I do have to admit that I have loved every moment! I have learned that my thoughts are most definitely not that only way of doing things. I need to always keep an open mind. It is important to give my perspective but to also think of how my words may come off to someone else. I have learned to always hear the other person out. I have learned that things I think of as normal farming practices may be totally unknown to others. It has been eye opening for me to share the smallest happenings on our farm and to get comments from others on how I have educated them. It has taught me to not be afraid to share our story. 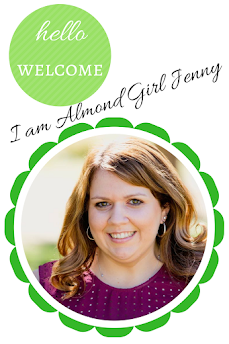 I am getting closer and closer to my due date with our little almond farmer! With my nearing due date though comes more and more cravings for anything sweet. Being that I feel like I have gained a hundred pounds though, I am searching for something sweet that isn't terrible for me. If you have read any of my recipe or food posts, you know by now that I like to experiment and can't follow a recipe if my life depended on it. So I tried this smoothie/ milkshake concoction and really liked it. Of course you can substitute almond milk for regular cow milk and almond butter for peanut butter. My almond farmer said he thought he was drinking an almond milkshake. It hit my sweet craving and now that I am telling you all about it, I think I am going to go make it right now.... Hope you like it! My almond farmer and I were honored to be featured in a California Farm Bureau Federation series article entitled 'Young Farmers & Ranchers, Making it Work'. We had a great experience being interviewed and photographed for the piece. You never really think what you do is something special, until someone else tells you so and wants to spotlight in. I was asked by some of my blog readers to post the article so they could view it. It was printed in the October 22nd Ag Alert newspaper, to have access and the original article you can become a member of the California Farm Bureau Federation. 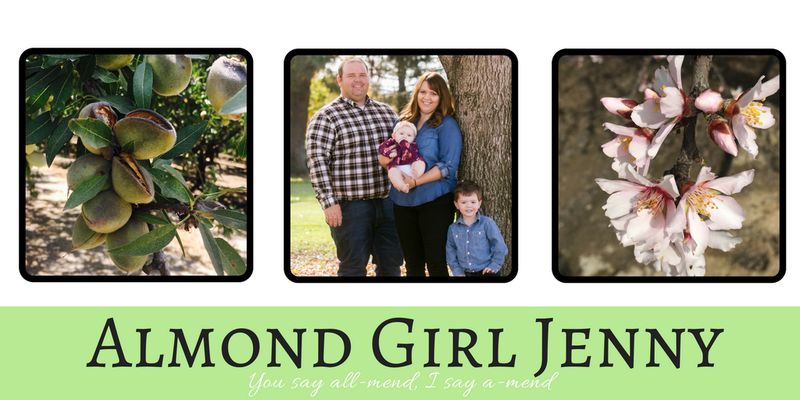 Fourth-generation farmers Tim and Jenny Holtermann, who work at the family almond farm and custom harvesting business in Wasco, have a passion for agriculture they say it is the product of each being raised on a family farm. I enjoy a handful of almonds multiple times throughout my day. I keep a dish in my kitchen full of them, so when I walk through to the back yard or to take something out for dinner, I am always munching on almonds. It got me thinking, how do others eat almonds? I prefer my almonds raw, straight from the tree. But since I can't get those but once a year, I have to eat them other ways. I love the taste of just a raw almond, something about the purity and untouched almond that makes it so good. I know my parents prefer them roasted in the oven with a little garlic salt, which is also good but perishable. I have a great party nut recipe I like to enjoy around game days and party times. Now that almond harvest is over, it is time to get our fields back in shape. It is what we call orchard maintenance time of year or after harvest clean up. Oh the life of a farmer, they never stop! During harvest, the picking up equipment will leave behind humps in the orchard rows. When the picking up machine picks up the almonds, part of the process is to leave the extra dirt in the field as a dirt mound. This process helps maintain the top soil in the field, and the more dirt we take out of the field and put in the trailers the more expensive trucking and hulling charges can be. The mounds in the middle of the rows will cause the tractors and equipment to travel through the field unevenly. This can be an extra problem for the flood irrigated and older orchards where the mounds could cause uneven water distribution. If the dirt mounds are left in the field until next harvest this could cause us to pick up even more dirt with the almonds next year. Because farmers never rest and my almond farmer doesn't take a break after almond harvest, we went up to Chico to help my dad with walnut harvest. And the most important thing, my little almond farmer growing in my tummy needed some baby gear from my family baby shower! Our almond huller is running in full swing, so I thought I would go and check it out! We belong to a cooperative huller, meaning the farmers who use its services own an interest in the huller. A select few farmers who are members of the cooperative are also elected on the board of directors. Most of the hullers in our southern Central Valley region of California are cooperatives. We also have a few large corporations and small growers in our region that operate private hullers as well. We lost suction on one of our agriculture wells. The ground water table has dropped below where our pump was set. So, when we turned on our pump to irrigate our orchard, it was pumping air instead of water. We had to have the well maintenance company pull the well out of the ground and inspect the pump to determine the cause of lose of suction. It was determined our pump was too short for where the water table had fallen. Now, we have to extend the pump at least 40 feet further down, so we can pump from the water table. We hope that this will work and we will be able to pump water again. Because of the drought, we have neighbors all around us drilling new wells. Farms are also pumping more from existing wells because we can't draw from federal or state water. Both these factors cause a greater dependency on ground water, causing our water table to fall deeper. In our orchards we have multiple varieties of almonds. These varieties mature and harvest at different times throughout the harvest season. We start with nonpareils, the most popular, most produced and most widely used variety. But a field of nonpareils most often has one or two other varieties that aren't ready to harvest for a couple weeks to a month later. When we flood irrigated, we weren't able to irrigate any of the orchard until the harvest was complete on the entire orchard. If we chose to flood irrigate, the orchard rows would be too wet and the machinery would get stuck. The weeds would also start to grow in the middle of the rows, making it difficult for the machinery to pick up the almonds. It's raining almonds! Literally! We started shaking our almond trees this week, officially starting almond harvest. We wait all year for this time to come and it's here. It will be a busy next couple of months that will set the future for our orchards. Based off orchard production we will decide which orchards may be approaching their end of life, which orchards will finally produce a crop and which orchards we need to use better farming practices on next year.